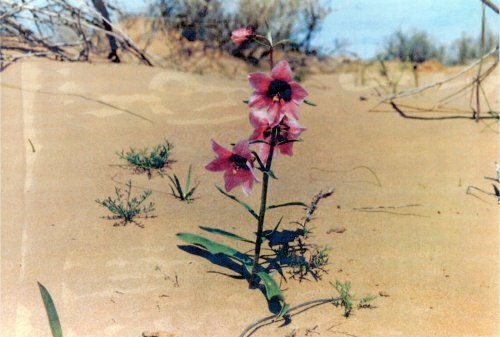 This genus was split from the genus Fritillaria and the species are retained in Fritillaria by many botanists. There are 4 species in the FSU. Central Asia (Pamiro Alay). On slopes, along streams. Bulb 1-2 cm diam. Leafy stem 15-30 cm. Leaves broadly-ovate or lanceolate. Flowers 5-8 in raceme, white, at base green or pale violet. V - early spring to mid summer. Fl - March in the wild (April in St. Petersburg). Fr - July. P - by seed, daughter bulb and scales. Requires sunny position, can grow in partial shade. Well-drained soil with enough water during the vegetative period. Suited to the rock garden. Z 6 (5). New. Central Asia (western regions, Balkhash and mountains of Turkmenia). Steppe, sandy soil, slopes. Bulb 1.5-2.5 cm diam. Leafy stem 10-20 cm. Leaves oblong-lanceolate, narrowed toward the both ends. Lower leaves 5 x 1.5 cm, upper smaller. Flowers 5-8, in a terminal raceme, nodding. Perianth segments pink-violet with dark spot at base, checkered in middle part. V - early spring to mid summer. Fl - March in the wild (April, May in St. Petersburg). Fr - July. P - by seed and daughter bulbs. Requires a sunny position and well-drained soil. Very well suited to the rock garden. Z 5 (4). New. Central Asia (Pamiro Alay, Tien Shan, Syr-Darya). On rocky slopes, on loam and gravelly places. Bulb small, about 1 cm diam. Stem leafy, 7-20 cm. Lower leaves broad, upper leaves narrow. Flowers 1-8 in terminal raceme, pale pink-violet. V - early spring to mid summer. Fl - March-April. Fr - June-July. P - by seed. Requires well-drained soil. Good for the rock garden. Z 6 (5). New. The next species is also of garden interest, but has not been tested. Caucasus (south Transcaucasus), Central Asia (mountains of Turkmenia) and southwestern Asia. On dry sandy soil and clay slopes. Bulb small. Stem leafy, 15-20 cm. Flowers 2-8 in raceme, 2 cm long, pink. V - in the wild early spring to mid summer. Fl - March. Fr - mid summer. P - by seed. Can be recommended for spring decoration. Z 6 (5). New.